Figure 25.2. Principle of MATVS. Hormone synthetic genes ipt used for selection are removed after transformation. (A) Recombination between two directly repeated sites (RS) results in deletion of the ipt gene lying between the sites. 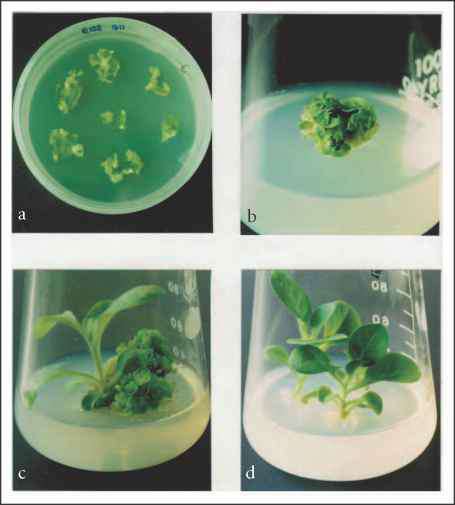 (B) Marker-free transgenic plants are identified as normal shoots which recover apical dominance. (a): Regeneration of adventitious shoots; (b): Differentiation of abnormal shoots which have lost apical dominance; (c): Appearance of normal shoots which have recovered apical dominance. Fig. 25.3.A. 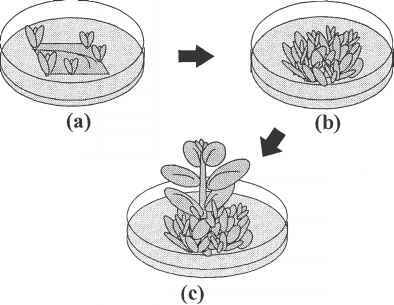 Transformation procedure for tobacco plants using MAT vectors. Cytokinin type (pNPI132): (a): Regeneration of adventitious shoots from leaf segments on a nonselective medium (hormone-free MS medium containing 500 mg/l carbenicillin); (b): Differentiation of extreme shooty phenotype (ESP) from adventitious shoots; (c): Appearance of "normal" shoots which have recovered apical dominance; (d): "Normal" rooted plant. the segregation of non-chimerical marker-free transgenic plants with a high frequency.4 These results indicate that the MATVS (pNPI702) also could generate non-chimerical marker-free transgenics without sexual crossing, and produce them more efficiently through crossing. Fig 25.3.B. 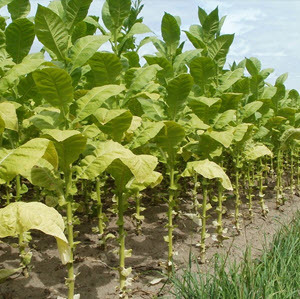 Transformation procedure for tobacco plants using MAT vectors, cont. 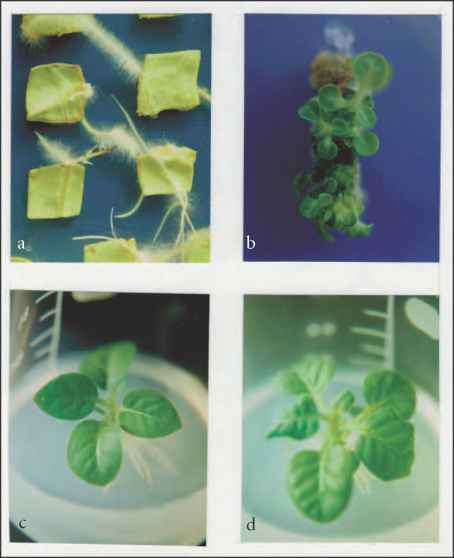 Auxin type (pNPI702): (a): Differentiation of hairy roots from leaf segments on nonselective medium (hormone-free MS medium containing 500 mg/l carbenicillin); (b): Regeneration of adventitious shoots from hairy roots; (c): Normal shoots; (d): Abnormal shoots (wrinkled leaf). 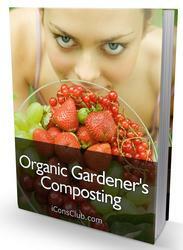 commercial genetic engineering. The MATVS enables us to overcome the disadvantage of altered phenotype and improve transformation efficiency in a wide variety of plant species.